What is a breed standard and why do dog breeds have one? It is a very good question, but it is also easy to answer. Centuries ago, when dog breeding became more of a business or hobby, Dog showing gained popularity. Individual breeds began to take shape and with them a written idea of what the breed should look and behave like. This was originally to aid the show judges but soon became a guide for breeders themselves. Often referred to a Standard of excellence a breed standard is an in depth description of the minds eye Ideal specimen. A dog who possesses every point of the standard of excellence would be the perfect dog for its breed, of course perfection is impossible as each reader/breeder will have a slightly different interpretation, so the Standard of Excellence is really nothing more than a guide to an ideal. I wrote the first breed standard in the early 90s as the Labradoodle Breed standard then the Australian Labradoodle. Since then the breed has continued to evolve and so has the breed standard until its present day. This is the first written standard for the Australian Cobberdog. 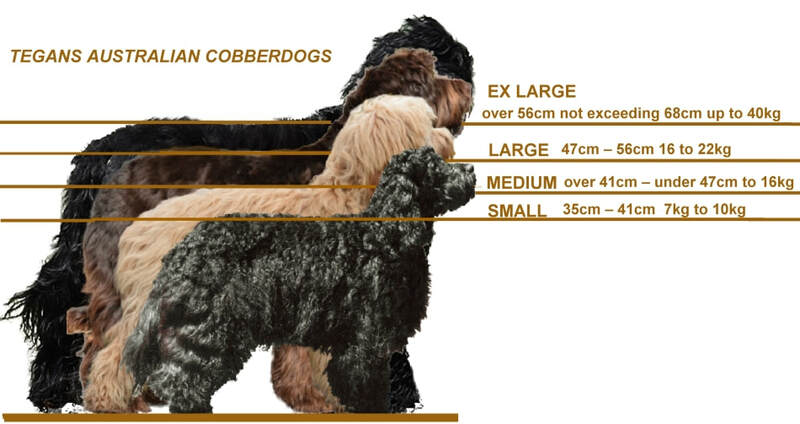 The Cobberdog Standard of excellence is written as an “ideal” goal to maintain a true breed type and preserve the three most important characteristics, Its Temperament, Its non- shedding easy maintenance allergy friendly coat and its genetic health. The Breed Standard faults, virtues and preferences are to aid in maintaining a dog of healthy mind and body suited to the purpose it was created for, an easy care non-shedding family companion and a community service dog. OVERALL IMPRESSION: Lack of exaggerations, Should immediately impress when viewing this breed, overall symmetry and balance, light footed athleticism and lively joyful aura . A sociable dog who is self - confident and is immediately ready to make friends with humans or other animals when invited to do so. He may be exuberant, joyful and bouncy, but never hyper active or busy. He should melt in your hands when touched. Their unique intuitive nature and the seeking of direct human eye contact should be easily discernible at a glance. The second distinctive feature of this breed is their Coat, It should be single, non shedding, be of even thickness, it must be a fine silky fleece texture, not at all thick heavy or dry, hanging in wavy or loose ringlets. Overall balance and symmetry are more important than absolute size. The dog, regardless of height class should be slightly longer than tall, on a ratio as twelve is to ten. There should be no variation in type nor temperament between the sizes. When shown in the Conformation Ring all three sizes may compete together or be split into size groups, with each size winner competing together for best of breed title. Males may be slightly more solid and show definite masculinity. Females should show femininity but not sacrifice strength of body and substance. It is the unique temperament of the Australian Cobberdog that sets it apart from all other breeds. Totally non aggressive, extremely clever, sociable, comical, joyful, energetic when free to be so, When approached and/or handled they should immediately divert their attention to the one who is touching them, they should seek eye contact with an inquiring expression, be calm and gentle. They should be willing to approach people in a friendly manner. The Cobberdog is a medium prey drive dog, making him a keen and easy dog to train. They possess an intuition, a unique ability to feel the physical and emotional state of the people they come into contact with. This ability to “know” is what has made the Australian Cobbedogs an excellent animal for individuals with special needs. Purpose bred and well suited for special work such as Therapy Dog, Assistance Dog, Hearing or Seizure Alert Dog Guide Dog , With their joyful quirky personality and athleticism they are also excellent sports dogs. Reserve of strangers, is a fault. Timidity, shyness or aggression is a disqualifying fault. There are two acceptable coats for Australian Cobberdog Breed standard. it is Non Hair textured, resembles a natural fibre that has more moisture content than hair, giving it a soft silky feel, Is not a soft fluffy feel. As with many animal grown fibres it collects in groups of growth called staples. The Australian Cobberdog coat description and characteristics were derived from the Angora goat. Is light reflective giving it a shiny fine silky look. The Fleece does not shed nor does the skin cells around the follicle shed. The Fleece does not have a dog smell it has no specific smell at all. Silky fine fleece texture It should look and feel light and luxurious. The coat gathers into soft clusters called staples that hang in waves and swirls, Most colours are light reflective giving an added look of luster. is slightly curly when clipped/cut but relaxes with length. A Standard sized dog with a mature well cared for coat will weigh less than 380 grams when clipped bagged and weighed. The Spiral Fleece: Also currently called Spiral Wool, though the term wool can be misleading to the inexperienced. Falls in a more defined curls giving it a spiral appearance. Staples are more defined. When cut/clipped the spirals curl more tightly than a wavy, and can increase the density feel of the coat. Unlike the wool coat it maintains the fleece qualities making it possible to regrow to full length. As the coat lengthens the curls quickly relax and fall downward into spirals. The Spiral fleece can be slightly heavier than the wavy fleece though lighter is better. A Light moist silky spiral fleece is a breeder’s ultimate coat achievement. Thick, heavy, dry textured, Tight springy curls, tight cord like staples or strong ripples known as crimping are all faults. Shedding, hair texture, or full or part short coat are all disqualifying faults. Slightly square in appearance with well-defined frontal bones. The Stop should be defined but not steep nor stepped, large slightly rounded eyes set well apart, must not protrude, nor be set back in the Orbit. The skull should be of moderate width slightly flat; smooth muscled cheeks and firm lips. length from tip of nose to inner corner of eye should be slightly shorter than from inner corner of eye to point of Occiput, at a ratio of ten is to seven. The head should be clean defined and free from exaggeration and be in proportion to the size of the dog. Muzzle is moderately short, broad and deep lower mandible but not excessively so and with firmly fitting lips. The head should flow naturally into a strong slightly curved lean muscular neck and not appear to be ‘stuck on’. Long narrow or 'Poodle' type head is a fault. to hazel, Ghost eyes are human like hazel with a slight green hue. Eyes should not be watery causing tear staining (note that puppies may sometimes have wet eyes during teething). A feature of the eyes is their very long sweeping eyelashes. Light eyes on dark coated dogs are a fault. Staring, harsh or expressionless are a faults. Set slightly above outer eye level. Leather should be of medium thickness, The leather should not hang below the lower Jaw. Well furnished, with long silky furnishing. Ear canal should be muscular, lifting when listening intently. The ear canal should be large, open and free of thick hair. Ear should not be heavy or drag down, they should lay lightly against the side of the head allowing for good airflow and health. Thick ear canal hair is a serious fault, narrow constricted ear canals are a serious fault. A notable feature. Large, round and fleshy in appearance. Large open nostrils with thick conjoining lip leather. Pigment of a rich liver rose or jet black depending on the dogs body colour. NEVER should there be Pink skin anywhere on the eye rims, lips, nose or pad Missing, patchy pigment or ‘butterfly nose’ is a serious fault. the withers and down to the prosternum. Firm with close fitting skin. Thick, firm and closely fitting with no obvious dewlap. The Bite must be a Scissor with full upper and lower dentition; Miniatures must not have large teeth in a small mouth. A level bite or crowded teeth is a fault, a Sharp triangular lower jaw is a fault, lower dentition between the two canines should be in a neat straight row. Is free from exaggerations nothing should catch your attention. The dog should stand slightly taller than long, as ten is to twelve. The flank is firm and slightly tucked. The top line is strong, Ideally Level or rising very slightly over the lions to a slightly sloping croup to allow for a medium/low or ideally level tail set. Chest reaches easily down to the firm flat elbows and does not push the elbows away from the flat muscled shoulders. Ribs well rounded but maintain the dogs clean smooth side of body. The sternum is well pronounced and free of round muscle. Front legs are straight through to the ground with no deviation. Hocks are perpendicular to the ground allowing the dog to stand slightly beyond square. Wither is pronounced allowing for a slightly low head carriage when in movement. Shoulders slope with sufficient angulation to allow full extension of the front limbs when trotting. Scapula and Humerus bones are long and broad well covered with long flat muscling. The forelegs are well boned but neither loaded nor spindly and perpendicular from the elbow to the ground. Cannons are only slightly longer than the short springy pasterns. Should be strong with angulation of the Femur and Tibia bones symmetrical in structure to the Scapula and Humerus bones. Well defined muscling inner and outer thighs, stifles long and moderately sloping with hocks straight, parallel to each other and perpendicular to the ground. Moderately Low set, saber in shaped and a graceful extension of the topline. Not more than and not less than one inch from point of hock. The Tail is well furnished with silky slightly wavy fleece. The last two thirds of the tail may be carried above the back when the dog is excited or in movement but it should be obvious that the base of the tail is set low from the slightly sloping croup. Sharply kinked, teapot or possum tails are faults, Tails carried high above the dogs head are considered a fault. Light athletic and graceful with the head carried fairly level or lower in relation to the wither. Movement should appear effortless and tireless with a steady purposeful happy attitude When moving with power and purpose the dog may two -track with the hind feet landing ahead of, and slightly to the inside of the front feet, When gaiting steadily in a straight line the dog will not two track. Puppies of standard and medium size in particular may two track during growth spurts. The Australian Cobber dog is a thing of beauty when in m﻿movement where it can express itself more freely. Ambling, pacing, prancing or high stepping are serious faults when in full gating movement. But are acceptable when exuberant at the walk.